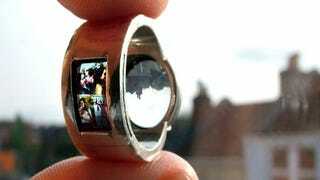 Not content with your run of the mill giant rock, soon to be award winning husband Luke Jerram teamed up with a local jewelry designer to create a custom mini-projector wedding ring. And a chorus of ten thousand Awwwwwwws rang out. "Congratulations on your engagement! I'm afraid this ring was a one off, made for my wife. I'm afraid you'll have to make your own unique ring for your own unique partner!"